As part of efforts to protect this rare species, the Hariyo Ban Program is supporting the establishment of a community-based red panda monitoring system in Langtang National Park and Buffer Zone. "District Health Office approves establishment of health post in Panchakanya, Dhading district, after pressure from community women." "Women secure representation on Shiva Shaktiswori Community Forest Executive Committee after speaking up for their rights." "Public hearing and public audit in Anantapur Community Forest recovers NRs. 11,464.00 of embezzled funds." It is not often that we read headlines like these, although this type of news is not uncommon in places where the Hariyo Ban Program has set up Community Learning and Action Centers. The centers provide an informal platform for rural women from (mostly) marginalized communities to unite and organize, enabling them to take a leading role in local social transformation. Ritu Lama, one of the winners of the song competition organized by the Hariyo Ban Program on International Women's Day, smiles as she gets ready to enter the recording studio. "I am very excited to get my song recorded. I want to pursue singing as a career and this is a huge encouragement." On the 103rd International Women's Day, the USAID funded Hariyo Ban Program organized a campaign on the theme "Amplifying unheard voices of women leadership in conservation and climate change". The campaign focused on messages about best practices and challenges faced by local women active in natural resource management through competition of inspiring songs and poetry. Click here to find more about the competition. Click here to watch the video of Ritu Lama singing "Sisters need to understand." 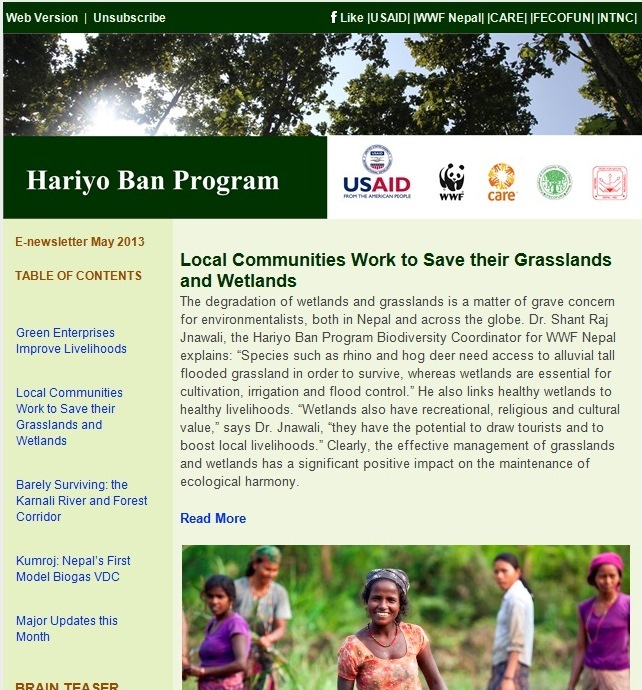 The Hariyo Ban Program works to help communities adapt to climate change and increase ecosystem and community resilience in a manner that benefits both nature and people. A good example of this can be seen in the village of Farm Tole in Basudevpur, Banke, which was declared as the district’s ‘First Model Village’ on 11 June, 2013. With the support of CARE Nepal through the Hariyo Ban Program, Farm Tole has used best practices to increase its resilience, making impressive advances in livelihoods, women’s empowerment, health, sanitation, and climate change adaptation. The development approach adopted by the Hariyo Ban Program in Farm Tole integrating conservation development and climate change adaptation became the basis of this success. •	On the occasion of Global Tiger Day on July 29, the Government of Nepal released the results of its tiger census. The total number of wild tigers in the country is now estimated to be 198, marking an increase in the population by 63% from the last survey in 2009. •	Community-based Ghoral conservation formally initiated in Jhyalbas of Nawalparasi. •	On 11 June, Farmtole declared a model village of Banke district for effective implementation of Community Adaptation Plan of Action. •	Field work for assessment of status, distribution and habitat of musk deer initiated in Manaslu Conservation Area (MCA). •	Finalization of research plan for biological and socio-economic assessment of Parsa-Bagmati corridor underway. •	Emission Reduction Program Idea Note (ER-PIN) development for Terai Arc Landscape and possible future measures shared in Kathmandu. •	A national level civil society organization consultation workshop on National Biodiversity Strategy (NBS) held in Kathmandu. •	Electric fence installation program carried out in Panchakanya Community Forest Users Group (CFUG), Ratnanagar-10, Chitwan. •	Biogas plants installed in Bachhauli and Kumroj VDC in Chitwan, and Hadikhola, Amleshwar and Churiyamai VDC in Makwanpur. 200 biogas plants are installed in Chitwan and 31 biogas plants in Makwanpur. •	Support extended to implement Community Adaptation Plan of Action in Avidhara, Dang. •	In addition, several activities such as plantation programs, initiatives on implementation of community adaptation plan of action, mass awareness and sensitization on climate change, and skill based training to marginalized communities were carried out the previous month.